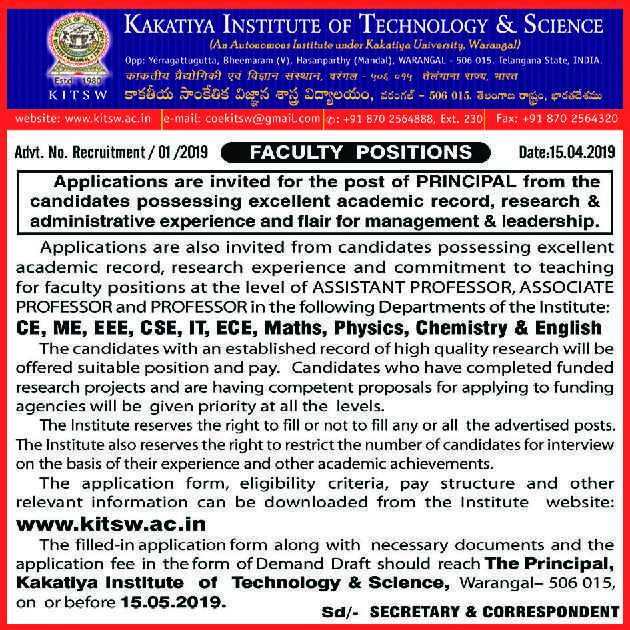 Kakatiya Institute of Technology and Science, Warangal has advertised in THE HINDU newspaper for recruitment of Professor / Associate Professor / Assistant Professor / Principal jobs vacancies. Interested and eligible job aspirants are requested to apply on or before 15th May 2019. Check out further more details below. About College: Started as an Undergraduate institution, KITSW has recorded an impressive progress and today it is a full fledge Post graduation institution with 7 B.Tech., programs, 7 PG programs. Six academic departments are recognized as the research centres by the KU, Warangal to offer doctoral programs. The campus is now Wi-Fi enabled and OFC connected with 100 Mbps internet bandwidth. KITSW became an Autonomous Institution w.e.f the academic year 2014-15. The Under Graduate Programs (with an intake of 900 per year) leading to B.Tech are Civil Engineering (120), Computer Science & Engineering (180), Electrical & Electronics Engineering (120), Electronics & Instrumentation Engineering (60), Electronics & Communication Engineering (180), Information Technology (60) and Mechanical Engineering (180). The Post Graduate Programs (with an intake of 187 per year) leading to M.Tech are Structural & Construction Engineering (24), Design Engineering (24), Digital Communication (25), Software Engineering (36), VLSI & Embedded System Design (18) and MBA (60). The total number of research scholars working in the research centres of this institute is 42. How to Apply: Interested candidates are requested to download application form from college website and send filled-in application along with copies of certificates, application fee DD and recent PP size photo to the postal address provided below.